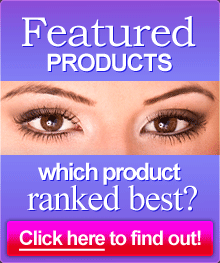 Renew Eyelash Revitalizer Reviews | Does Renew Eyelash Revitalizer Work? While long, lush eyelashes are a hallmark of health and beauty, few people are born with naturally thick and long lashes. Luckily, there are a number of excellent eyelash growth enhancers available for purchase, but there are also quite a few eyelash growth products that promise results but do little to deliver. In order to separate the top performers from the under-performing products, we've conducted extensive research. 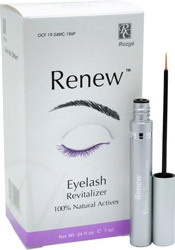 Renew Eyelash Revitalizer, offered by Rozge Cosmeceutical, promises to turn brittle, sparse, and thin lashes into long, thick natural lashes. The product, which is hypoallergenic and non-comedogenic, is intended for use by both men and women. Rozge Cosmeceutical also offers a separate Eyebrow Revitalizer product which encourages the growth of sparse eyebrows. User reviews pertaining to the effectiveness of Renew Eyelash Revitalizer are mediocre at best. While the majority of customers did eventually see some improvement in their natural eyelashes, this change could take as long as six months to occur, which is a very long time to wait in comparison to the performance of other comparable eyelash growth products. In addition, a substantial number of customers saw no noticeable difference in their eyelashes and stopped using Renew Eyelash Revitalizer altogether. The website notes that Renew Eyelash Revitalizer's formula is "professional" but does not explain what is meant by this designation. Ingredients found in this product include Apigenin, Oleanolic Acid, Biotin, Hydrolyzed Soy Protein, Azelaic Acid, Proanthocyanidin, Methylparaben, and Propylparaben. Side effects from the use of Renew Eyelash Revitalizer are fairly rare but do occur sometimes; the main complaints from some users include redness and minor eye irritation. For most users, these side effects resolved after the first few uses of the product. Of more concern to us are the inclusion of the ingredients Methylparaben and Propylparaben that are found in Renew Eyelash Revitalizer's formula. Parabens are linked to an increase in the rates of occurrence of some types of cancers, and most health and beauty products have phased out these controversial ingredients or are in the process of actively phasing them out. We like that Renew Eyelash Revitalizer's ingredients do not include prostaglandins or related derivatives; some of the eyelash enhancement products currently on the market do contain these ingredients, which can cause darkening of the skin around the eyes and permanent darkening of the irises. However, we are not convinced of the effectiveness of Renew Eyelash Revitalizer in comparison to other eyelash growth products that are readily available. Many users did not see a change in their eyelashes for several months, and some never saw any change at all. In addition, having to buy one product for the eyelashes at $80 per tube and then shelling out another $115 for the companion eyebrow enhancement product seems to be out of reach financially for many consumers. To learn about an effective eyelash growth product that is paraben-free and has a track record of success in promoting measurable growth in the length and thickness of the lashes, read our reviews of MarveLash now.